$1 in 1963 would be worth about $7.78 (£5.93) in today's money. Aunt May and Uncle Ben are both old; there is no indication as to what Uncle Ben's job was, if he is retired, or whether he has a pension. Peter Parker makes several appearances as Spider-Man over some days or weeks, but we are not told what he paid for them. Spider-Man earns $100 dollars for wrestling Crusher Hogan. Peter and Aunt May are sufficiently short of money that they are in danger of losing their rented home, and May has to pawn her jewelry to pay rent. I think Stan Lee intends us to infer that the cheque that Spider-Man cannot cash is for all his TV appearances. A modest house costs between £800 and £1000 to rent in my city right now, so I am going to assume that May's rent in 1963 was about $150. 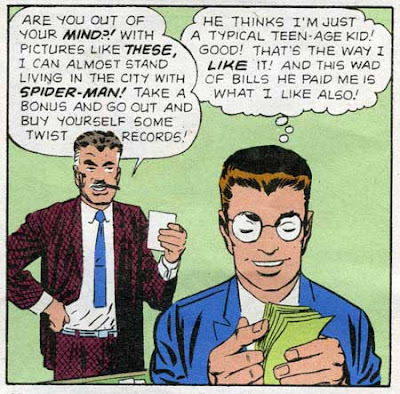 Jameson pays Peter Parker a sufficient amount of money that he can pay 12 months rents (plus, presumably, pay the backlog and get Aunt May's jewelry back) and have enough left for a kitchen make over. There are clearly 8 pictures, so if we called this $2000 it would work out at $250 per picture. Peter blows the whole cheque in one go, without putting anything by for living expenses. It's hard to determine if Jameson is paying fairly or not. In real life, photographers are usually paid by the assignment, not the shot: the British NUJ suggests that photojournalists don't work for less than £250 per day (maybe $50 in Parker's time.) Paparazzi make much more than that. but generally by building up portfolios and libraries of shots that can be licensed over and over. Particularly exclusive shots can go for fortunes -- paps told Princess Di that if she would look up and smile, they'd be able to send their children to private school. The scumbag who photographed John Lennon's body was reportedly paid $5,00 for his trouble. Parker doesn't make any sales, but "couldn't care less." This suggests that Aunt May does have some income, however meager, because there is nothing in the kitty. Parker asks Jameson for an advance (!) which he needs to buy science equipment to finance improvements to his webbing: him and his Aunt must be surviving quite happily now that the rent is paid. The pictures are valuable (although they are actually faked) and Peter is pleased with the money; but I don't think it can be as huge a sum as he got in #3. Parker sells Jameson photos of the fire at Doom's hide out, but Jameson doesn't think they are worth very much. Aunt May insists that Peter goes and gets his sprained arm looked at by a doctor. Amusingly, BUPA would charge about £70 for a 15 minute GP appointment in today's money, which is almost exactly equivalent to the $12.50 Peter got for the photo. No pictures sold at all. Aunt May needs an operation costing $1000. Parker sells (fake) pictures to Jameson for $1000, although Jameson says that they were really worth as much as $20,000! It isn't clear what May's condition actually is: I would have thought you would have been talking more like $10 - 15K for heart surgery.